The London Electricity Young Artist' Series enabled us to hear Helen Reid again at Blackheath quite soon after her February recital. This was quite a night! Thunderstorms had just caused flooding through my roof and that of the Recital Room, so the recital (before a lamentably small audience again) was transferred down to the Great Hall. Helen Reid took this in her stride, and only noticed after her Mompou opener that the lid of the Fazioli (which she had never played before) had not been opened. It had sounded so delicate that I had supposed the decision might have been hers! Ravel's Sonatina suited her command of texture and colour, and fastidious ears, perfectly and her bravura in Schubert's C minor Sonata (D958) showed a complete command of its formidal technical demands - nothing shirked. A lightening of texture and buoyant rhythm helped to ensure complete attention right through to the end of the captivating finale. 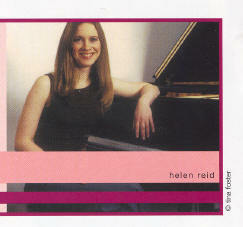 To make a link with the earlier recital, Helen Reid's encore was a small piece by Scriabin. She shared many of her undemonstrative stirling qualities with another admirable young pianist heard a few days back. There is certainly a generation of musician-pianists, not all competitive speed merchants, in waiting to take over from the oldsters! Next year the LEYA pianist will be Marcus Andrews, who is booked next month for Cheltenham Festival. The regulars who often fill the Sunday Morning concerts at Blackheath Halls ought to stir themselves and support some of the weekday evening recitals there.